In John 7:37, Jesus teaches that we have a spiritual aquifer which can be drawn upon which will bless our lives. “Out of your belly shall flow rivers of living water”. If you are thirsty and dry your faith will enable you to draw water out of the wells of salvation (Isa 12:3), the well is in your belly, in the hidden man of the heart (1Peter 3:4), your spirit. Faith is the essential prerequisite to a passionate, meaningful, impacting, and rewarding walk with God. There are certain things we can do to INCREASE our faith-. In this series we will be sharing some ways to ignite your faith and draw deeply from the well of the Spirit which is in your heart. It is difficult to live the life of faith if you are living a double life or have one foot in the world and the other in the church. This is what Elijah understood when the prophets of Baal had so influenced the people that if he hadn’t stepped in they may have turned away from the true God. In an epic display of prophetic boldness Elijah challenged the false prophets to a spiritual dual while urging the people to leave the double life and consecrate themselves to God. “How long will you falter between two opinions? If the LORD is God, follow Him; but if Baal, follow him” (1Kings 18:21). The result of the showdown was the defeat of 450 prophets of Baal and the rebuilding of the altar of the LORD that had been torn down. The people fell on their faces and declared that the LORD, He is God. Their faith in God was restored when the altar was built and they had consecrated themselves to Him. What is the altar we are referring to? Consecration is living for Christ, for His glory. His purposes. Carrying His heart, His love. Living to please Him in all things. Keeping His word and walking in faith and conviction in an unbelieving world. Staying on the altar is living life His way, not my will but His be done. It is worshipping Him is spirit and in truth, offering up continual praise with a thankful heart…this is our reasonable worship. 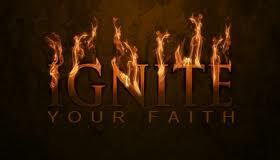 Living for Christ ignites your faith and builds a strong confidence with God. Leviticus 8:22:– the ram of consecration. Jesus has provided everything we need to live powerful lives before Him through faith.We have a supernatural water supply abiding in our spirit. Our faith ACTIVATES this well and we begin to draw LIVING WATER into our lives. Our Faith brings us close to God and trust in him. Coming to Christ who is both altar and sacrifice, and applying His shed blood to our lives is the key to consecration and robust faith. As we consecrate our ears (what we hear), hands (what we do), and feet (where we go) to the Lord we are WHOLLY CONSECRATED to Him. Our faith is ignited when we CONSECRATE ourselves to God.